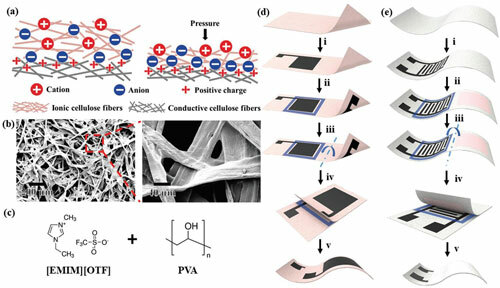 (Nanowerk Spotlight) Because it is easily available, low-cost, insulating, flexible, and portable, paper has been recognized as a particular class of supporting matrix for accommodating biological or chemical sensing materials. You have probably come across pH papers, blood glucose-sensing strips, and early pregnancy detection kits. Thanks to more recent developments in this area, nanotechnology-enabled, paper-based sensors promise to be simple, portable, disposable, low power-consuming, and inexpensive sensing devices that will find ubiquitous use in medicine, detecting explosives, toxic substances, and environmental studies. Thanks to their fibrous structure, papers can be modified with functional additives, such as carbon-derived materials (e.g., carbon nanotubes and graphene), conductive polymers, and metallic nanocomposites, leading to new functionalities and sensing modalities. For an overview of the many applications being developed with paper sensors, see these examples in our previous Nanotechnology Spotlights: "Simple nanotechnology paper sensor for detecting toxins in water"; "Biosensors printed on bioactive paper"; "An optical sensor platform based on nanopaper"; "Cheap nanotechnology paper-based gas sensors"; or "Wearable health monitor based on household paper". Previously reported pressure-sensitive papers, along with the pressure sensors made of them are primarily based on three existing sensing mechanisms, i.e., resistive, capacitive, and triboelectric. "Recently, a brand-new mechanism of pressure sensing, known as flexible iontronic sensing (FITS), has been introduced, which utilizes pressure-induced capacitive changes between electrodes and ionic surfaces," Tingrui Pan, a professor at UC Davis, tells Nanowerk. "Notably, unlike the conventional resistive and capacitive sensing modalities, the iontronic pressure sensor, based on the unique FITS mechanism, has shown extremely high sensitivity and resolution, while the parasitic noises can be largely negligible, given its ultrahigh signal-to-noise ratio." In their new paper in Advanced Functional Materials ("All-in-One Iontronic Sensing Paper"), Pan and his collaborators introduce a single-sheet iontronic paper substrate with both ionic and conductive patterns as an all-in-one flexible sensing platform. "Our novel sensing paper extends the iontronic sensing principle to a more adaptive material system, with direct printability, custom cuttability, and 3D foldability at a low cost – just as regular paper," Pan points out. It now has become possible to construct pressure sensing platforms via simple printing, cutting, gluing and folding. And since pressure sensing device are on longer restricted to a planar device, 3D pressure sensing origami to detect spatial pressure are now also possible. Basically, everything and every surface around us can be transformed into a sensing structure – on smart toys, smart packaging, personal wearables, disposable electronics, wallpaper, furniture, etc. or as flexible human–machine interfaces. "This opens up a future where everything we touch has tactile ability, and people can communicate with any object by touching, pressing and flapping, offering a comprehensive human-object interface via visual, auditory and tactile inputs," notes Pan. There are still a few kinks to sort out, though. For instance, there are interconnection problems: Current signal interconnection between paper electronics and signal processing system via conductive gluing still has reliability issues. The team is confident that low-temperature soldering and a specific paper-FPC (flexible printed circuit) interconnect slot can solve this problem. "Sensor device research is no longer just about the sensing elements; energy supply, signal processing, and electronic circuitry should be considered and such an integrated device should also be compatible with skin, cloth, and so on in shape, modulus and functions," Pan concludes.